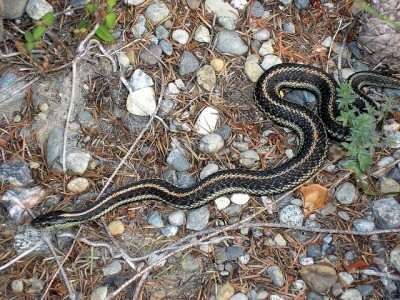 The Bruce Peninsula has lot’s of snakes, I have to admit just looking at a picture of one makes me shudder. I feel bad that I am predisposed to feeling empathy for things with fur, but run faster than the wind when I see a serpent. When we decided to take our vacation it was the one thing that created reluctance for me when hitting the hiking trails. The whole week I was hyper vigilant, any sound of movement off to the side, like a rustle of leaves would raise the hair on the back of my neck. I felt a state of bliss on the drive back to Waterloo that not one limbless little reptile made it self known to me. Today has been a beautiful one, I was out walking with Mattie and Pud, we strolled through our neighbourhood and I was getting back into the groove of our routine. I decided since it wasn’t as stinking hot as it has been for the last few weeks that we would deviate from hugging the shade to embracing the blue skies and do a longer route. The sun had ducked behind a cloud as we headed down a gravel path in one of the parks I like, Mattie startled and I looked down and holy crap, it was a freaking Garter snake! My first thought, “Are you serious?” Am I back up North? I let out a little shriek, which honestly is progress for me, normally I go into a full on panic, and scream and sprint away. Instead I looked down and watched this wee little creature slither over towards the long grass and was truly grateful one of the dogs didn’t get a hold of it, it was safe. The other cool thing, as we progressed onwards I wasn’t completely bent out of shape, I enjoyed the remainder of my time with Mattie and Pud. I would be lying to say when I head back that way this evening with the boys that I won’t have my eyes peeled, but I am really working on loving all creatures!! That is progress for you! And the poor little thing is a ‘Garter’ snake – ironically like the lingerie I guess.